I have begrudgingly accepted the fact that it's not going to get warm anytime soon and snow is very, very likely here in the Midwest. 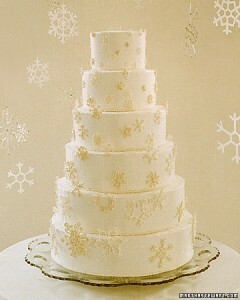 And so, I decided to share a cake that evokes that wintry feeling – the snowflake wedding cake. You have to admit, even if you aren't a fan of snow this is a beautiful cake. It's a six-tier stunner frosted with Swiss meringue that really looks like snow. And the royal icing snowflakes grow in size from top to bottom, giving the effect of falling snow. I have to say I do love snow when it first falls and is all pretty and white and sparkly in the sun and this cake makes me think of that first snow. Pretty, white, and sparkly. It would be stunning at your winter-themed wedding, especially if you added some red accents to your theme. You can find out more about the snowflake wedding cake here.